From November 21st to December 2nd, 2017, Hanoi National University of Education sent delegates to visit and work with the Jaist Institute (Japan) . The delegation of Hanoi National University of Education is composed of 8 members, including 6 lecturers from different faculties (Faculty of Information Technology - 02, History - 01, Special Education - 01, English – 01, and Science and Technology Office - 01), a student from Faculty of Information Technology, and a Mathematics student. As the delegation’s members are very diverse in terms of expertise, the experience at JAIST is different in some ways. Here are a few exchanges of Assoc. Dr. Duong Minh Lam - Head of Delegation - after visiting and working at JAIST Institute. JAIST - Japan Advanced Institute of Science and Technology - a research institute based in Komatsu, a small city in central Japan, about 2.5 hours travelling by Japanese bullet train (about 500 km) from Tokyo. Komatsu is well known in Vietnam for industrial equipments such as trucks, tipper trucks, forklifts, etc. But few people know the existence of Jaist - a leading research institute. 1. JAIST Institute’s Infrastructure: Jaist Institute is about 20 km away from the center of Komatsu, about 7 minutes travelling by the Institute's internal bus to Tsurugi and from there it takes another 30 minutes to get there by train.here Its location is not too difficult to travel to the center but also not too convenient to create a private, peaceful space suitable for studying and researching higher education level. Each building is designed to ensure that the research space is focused but not constrained. Each lab room of the group is quite large (100 m2) including rooms of professor / associate professor / assistant professor and a working space reserved for postdoc, PhD students and masters students. Each laboratory has its own seminar room, which is large enough for about 20 people, equipped with boards, projectors, tea.... It is a place for researchers to exchange ideas and news. progress reports, comments on the research process, learning in groups and outside groups. The research space is also highlighted by the utility's design, where there is a toilet, a cupboard for every 30 meters, a multi-purpose garbage bin, a printer room, a public photocopier, a room to drink coffee with tables and chairs sufficient for up to 4 people, with natural light overflowing windows, mountain views - where people can relax or focus on new ideas. The scientific and cultural exchange program was designed in strict accordance following the plan. The lesson about the administrative procedures for the scholarship recipients in the delegation was the simplicity and convenience, but no less strict in administrative management, financial, created pleasant feelings for lecturers and students. All administrative, financial procedures were available, through the internet and the diligence and professionalism of our staff. When the delegation arrived, the lecturers and students only took 10 minutes for each person to fill out personal information, students then received their ID. Next, the delegation went to the financial department to receive scholarships. The basic difference was that each scholarship is packaged, sealed and had the name of each person there, indicating the amount of money. When we arrived at the finance department, we only signed the receipt. The team completed the procedure of receiving money in about 7 minutes. On the last day of the trip, all members needed to complete the survey form and sent an email to the representative. However, the delegation took the initiative to thank and greet their warm and thoughtful welcome. The delegation has the opportunity to meet and discuss with the teachers, the professor directly introduced the laboratory, the research direction, attend lectures, seminars, poster sessions at the institute. Through these activities, members of the delegation felt a strong love for science from the professor as well as the PhD students here. Although the strength of the institute is to research in the areas of knowledge and information technology, but after visiting the labs, attending seminars, reading documents introducing the Institute, the delegation of Hanoi National University of Education found that the The research area of ​​the institute is diverse, covering almost every fields as well as current issues in information technology, directly related to the development of science, technology, and economy. Studies at JAIST always try to balance between academic and applied research, many research problems are ordered from government, company, etc. The study and research environment at JAIST is really good: shared spaces, libraries, labs, etc. The facilities include: Nano-materials center, high-performance computing center are all equiped with the most modern devices. In addition, some in-depth researches, in accordance with the expertise of the members like Prof. Hidaka Shohei’s research which deals with education for children with special needs: language intervention for children with difficulties in learning language, having behavioral problems, and memory impairment, Modern, effective teaching methods at universities from Prof. Kim Eouyoung, Prof. Ho Tu Bao, Huynh Van Nam ..., Applied research in psychology, physiology, neurology, information technology ... is integrated in the research of Prof. Tsutomu Fujinami and other in-depth studies on materials written by Prof. Suzuki. Highly integrated researches are indeed a great lesson which open the way of researching and studying for the team’s members. Although Japan is one of the world's most advanced economies, science, and technology, the visit also shows us that Japan is a country of traditional culture. 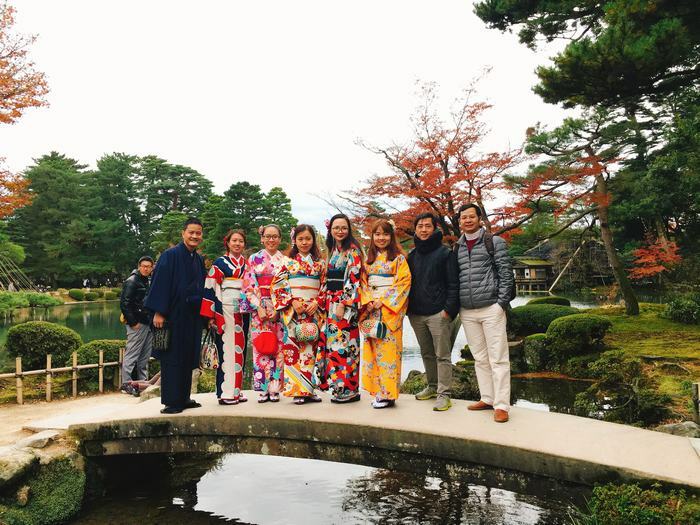 During the trip, the delegation had a chance to visit the Kanazawa garden, the castle, the Geisha neighborhood, the city of the generals and samurai warriors ... The historical relics are well preserved which reflects the great thought as well as the determination of the Japanese. Kimono is an unforgettable experience when the members had spent 20 minutes wearing Japanese traditional clothes. The experience is further exacerbated by the cold weather, low outdoor temperatures of 5 ° C, with clogs and Kimono for five hours which caused painful and cold feet ... But pain and cold can not be stronger than joy when we became the center of the resort thanked to the Kimono. Many Japanese tourists applauded the teachers, the boys of the delegation were very beautiful in traditional costumes, they took photos and congratulated us with warm-hearted words. This is also a worth learning point in the design of science and technology and partners exchanges of HNUE. At the end of the visit, the delegation had a day for the members to report on what we had gained during the visit with JAIST’s professors. The delegation of Hanoi National University of Education had introduced the tradition as well as the mission and vision of HNUE. The members of the delegation also shared about their own researches, what was gained during the trip and our desire to cooperate. Especially the two students had some experiences for the first time in the international environment. JAIST is definitely an opportunity for people who love scientific research and partnerships with Hanoi National University of Education in the future since the scope of research is very suitable with what we are implementing. To promote collaborative work, our university, students. and researchers, who will be sent to study and research need, to have a thorough knowledge base as well as Japanese language and culture. With the relatively open mechanism of Jaist Institute, based on the long-standing cooperation between the Government of Japan and Vietnam, between Jaist and the HNUE, long-term collaboration needs to be stimulate. The delegation hopes that the trip is a good start, and we are all ready to contribute and strengthened the cooperative relationship between Jaist Institute and Hanoi National University of Education.